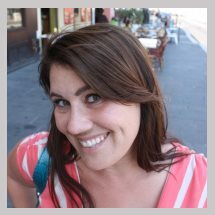 This is my third Melissa’s Produce Challenge with the San Diego Food Bloggers! It should be my fourth but there was that whole giving birth thing that kind of got in the way of creating and posting a recipe from a mystery box of ingredients “Chopped”- style. I love these challenges. They force me to get my creative juices flowing and when the box arrives, the ingredients stare me down and dare me to use them in unconventional ways. This time, Robert from Melissa’s really outdid himself with challenge ingredients. We had so much to choose from and it was hard to decide exactly what to make with them. 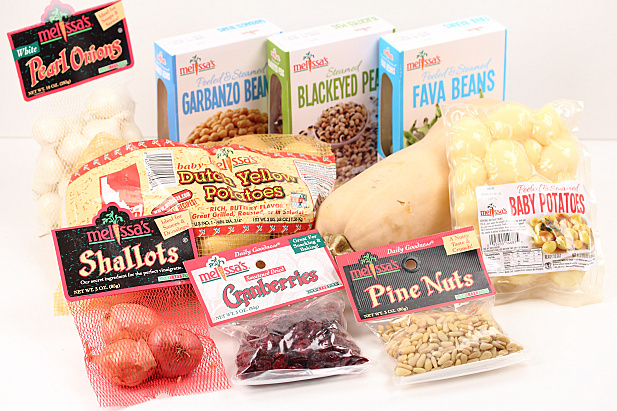 We were sent a bag of Melissa’s famous DYP’s (that’s Dutch Yellow Potatoes for you novices), a butternut squash, steamed blackeyed peas, steamed garbanzo beans, steamed fava beans, steamed baby potatoes, shallots, pearl onions, cranberries and pine nuts. The challenge is to make a recipe with at least 3-4 of the challenge ingredients and 1-2 other ingredients. I was torn between making a soup with the beans and potatoes, and doing something with roasted butternut squash. In the end the squash won for this challenge because I really wanted to get at those sweet cranberries and I just couldn’t picture them in soup no matter how hard I tried. I’m still making that soup, though. It’ll just be a later post. 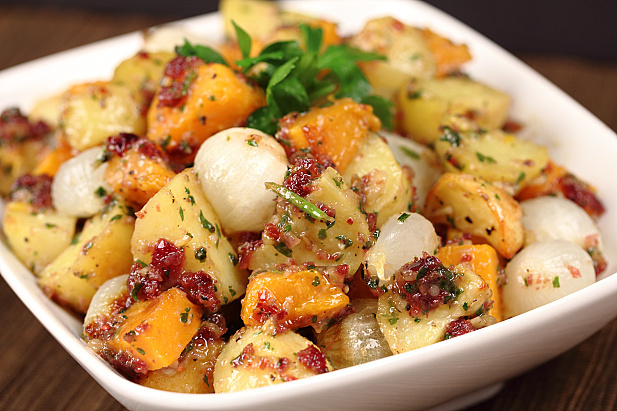 I love roasting vegetables, especially root vegetables and squash. It takes minimal effort and results in richer tasting food which is always a good thing. My goal for this salad was to make it taste like one of those special salads at the Whole Foods counter. You know, the ones that sell for like $20 a pound. M put his husband seal of approval on my efforts and assured me, “people would pay good money for this $#%&”. What really makes this salad special is the pesto. 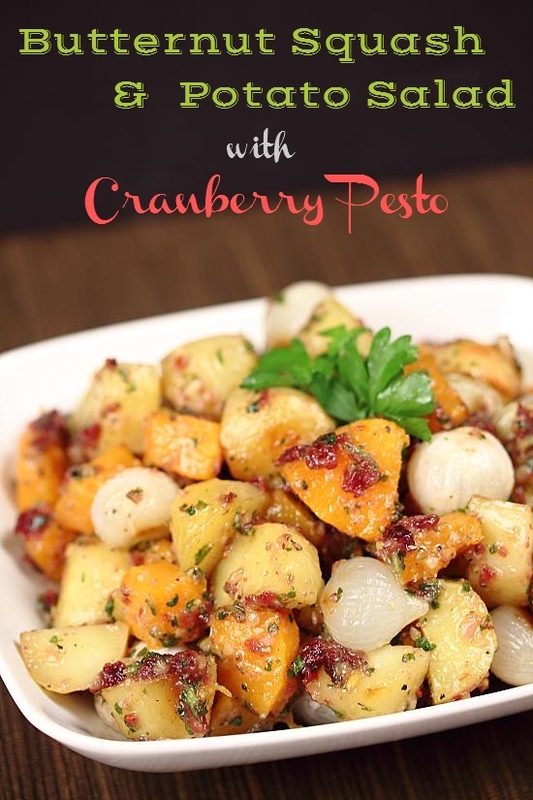 Cranberries, pine nuts and parsley come together to add tart sweetness and really brighten up the squash and potatoes. 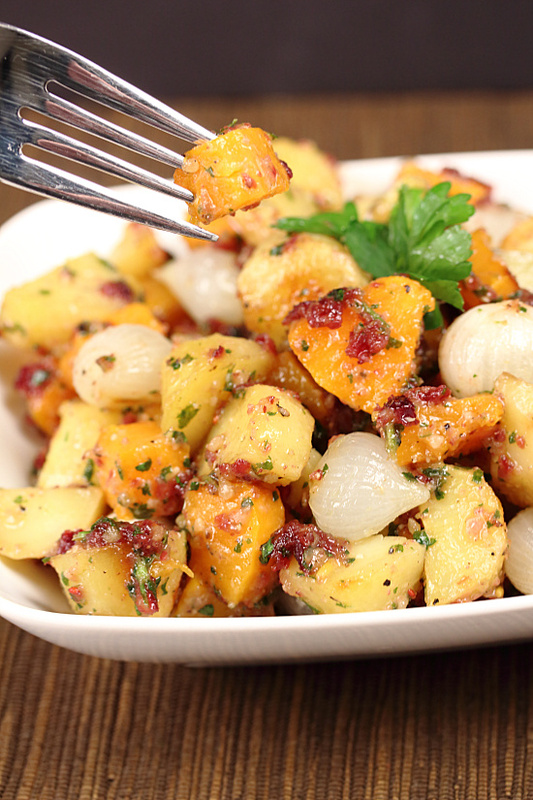 This recipe is easy to make for a crowd (Hello! Thanksgiving is right around the corner!) or dialed down for just two. I like it best chilled but it’s also excellent tossed warm right out of the oven. A big heartfelt thank you goes out to Melissas’s Produce for providing us with the opportunity to carry on these seasonal produce challenges. 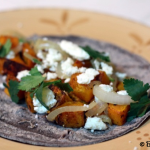 Check out what all the other participating San Diego Food Bloggers made with these ingredients on the linkup below and find Melissa’s Produce products online or at a store near you. 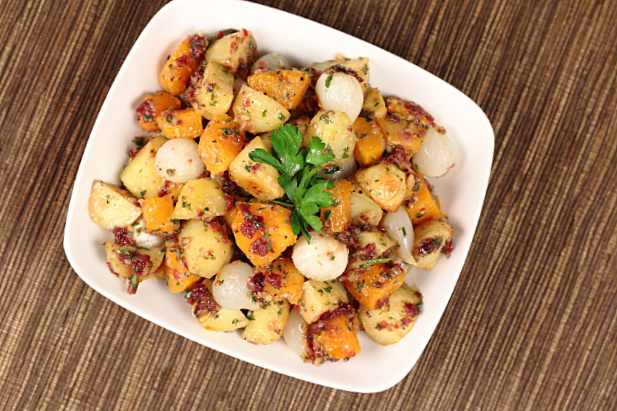 In a large bowl, toss together the squash, potatoes and onions with 1 Tablespoon oil, 2 teaspoons kosher salt & ½ teaspoon black pepper. Spread out in one layer on a baking sheet lined with parchment paper. Bake 30 minutes, tossing halfway through cooking. 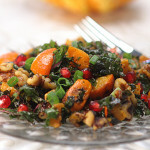 Meanwhile, in a food processor, combine the shallot, cranberries, pine nuts, parsley, apple juice and lemon juice with the remaining ½ teaspoon kosher salt and ¼ teaspoon black pepper. 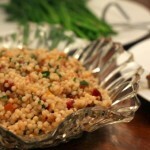 Pulse until finely chopped and then process on low while drizzling in the remaining 1 Tablespoon oil. Lightly toss the vegetables with the pesto while still warm. Serve immediately or chill and serve cold. YUM! 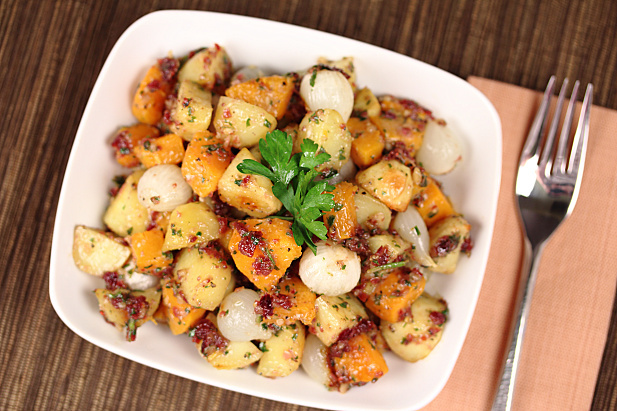 The combination of flavors in this recipe screams fall! Wonderful use of the challenge box! 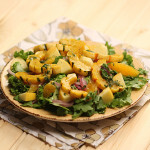 Potato salad is something I just don’t make all that often, but the butternut here has me totally intrigued! Oh, Kim, I love love love potato salad. 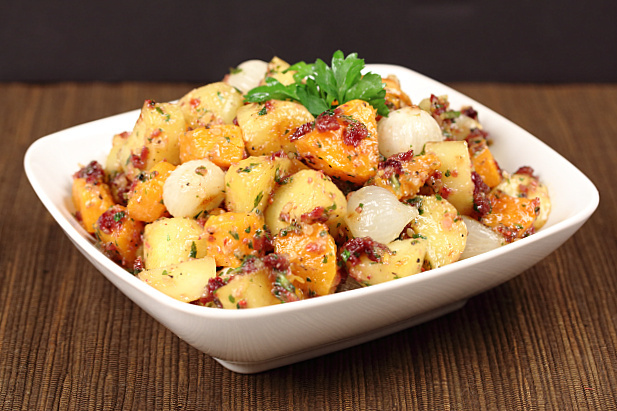 The butternut adds a lot of sweetness. This looks so delish. Love your creativity, especially the cranberry pesto. Perfect Thanksgiving recipe!